If creativity is the center of human development, then ISKN‘s iSketchnote has truly expanded and optimized the horizons of our imaginations. In the past, companies such as Wacom have provided the means to use pens to touch digital surfaces. But the ISKN is much different than Wacom tablets and Livescribe pens. With the ISKN, you are able to simply put a magnetic ring around your pen, and the ISKN slate will know where the pen is. 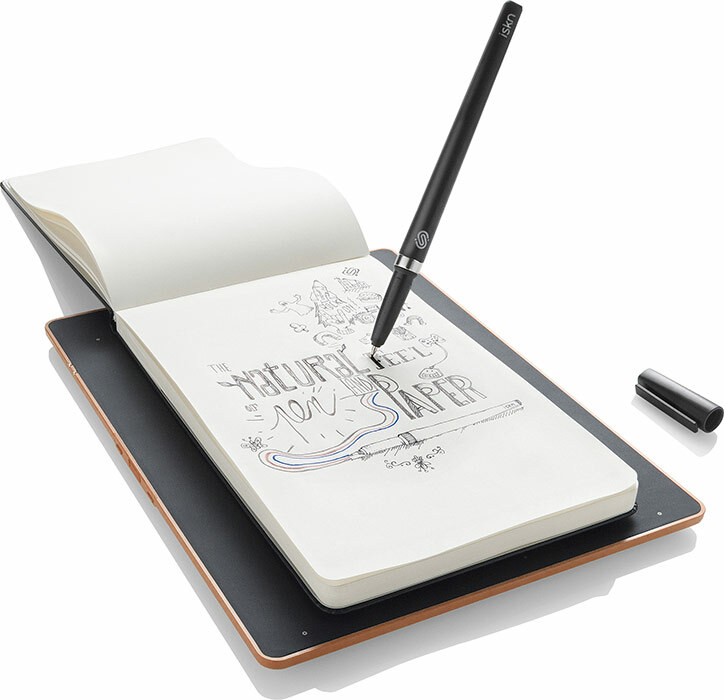 The slate then communicates whatever you are drawing to your tablet or computer. This way, thoughts, ideas, and images can be more easily stored and shared. However, doesn’t the traditional sense of creativity get lost somewhere amidst this technological marvel? Luckily, ISKN is already one step ahead in solving this question with their innovative smart sketching surface. Since its Kickstarter campaign in the fall of 2013, ISKN has raised over $340,000 and $2 million in seed funding. This year, ISKN was present at the International Consumer Electronics Show (CES). The international CES, which is held in Las Vegas every year, has been the place for new and innovative technologies for over 40 years. It has helped the ISKN gain popularity due to the fact that artists can use it to digitize their work as they go. The iSketchnote allows the creator to use their traditional template of choice – whatever type of pen and paper they wish to use to most accurately convey their creations. They aren’t directly drawing on anything electronic. Instead they use their own pen, draw on any type of paper, and as long as they keep the ISKN slate underneath the paper, the drawing will be transferred to their tablet or computer. They can then tweak the image digitally, however they need to. Because of this, they are not confined to using a digital pen and screen to depict what they truly want to share with the world. The magnetic ring placed around the pen traces the image right onto the screen, without actually having to touch the screen at all. This creation, combined with the various apps that ISKN is working on, is a revolutionary feat that combines optimization with pure creativity – giving the creator the best of both worlds. The designer of iSketchnote, Christophe Chedal Anglay, expressed, “I can’t live or work without drawing – and I can’t live or work without my computer and iPad. When the innovative engineers at iSketchnote asked me to join their team I thought it was my dream job come true! I just couldn’t believe iSketchnote was that close to a reality.” The reality is that in these times, most of us can’t live or work without gadgets in our busy lives, so the iSketchnote is a perfect tool to provide convenience and mobility without sacrificing the traditional sense of creativity.